Let’s face it: Very few of us look a new puppy in the eye and think, “You and I are going to make a difference in the world.” But that was Chad Burgess’ vision when he and his wife Carla were picking out their first dog from a litter of Golden Retriever puppies. One puppy stepped out of his pack into a perfect heel at Chad’s side. “Gopher chose me,” says Chad. Chad was hopeful that he and Gopher could become a therapy animal team. A therapy animal is a specially trained animal that partners with their human handler to volunteer at a variety of facilities and events, bringing joy, comfort and companionship to those they meet. It can be difficult to judge whether or not a dog is a good candidate for therapy before actually getting into the training. A friendly, patient temperament and enjoying the attention of strangers are musts. Less easy to predict is how well dog and handler relate with each other. They will be constantly reacting to new and unexpected situations where success depends on their ability to communicate effectively with one another. With a strong obedience foundation, they enrolled in Therapy Dog training with TCOTC therapy dog department head Carol Ouhl. When asked how long it takes to complete the training, Chad responds, “There is no set length of time. However, the more situations that you are able to face in training class, the more comfortable you will be when you get into in real life settings. For example,” he says, “it can be unbelievably uncomfortable when a patient cannot or does not speak during a visit.” In advanced classes with Carol, they try to replicate uncomfortable and unanticipated situations like this in the safety of the classroom. 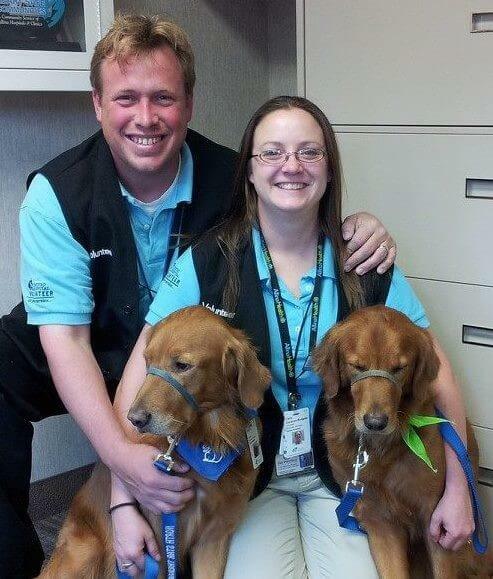 Therapy dog training is not focused on the dog, but rather on the team as a unit. As a result, over time Chad and Gopher have developed a shared language. Gopher will even use his communication skills when Squirrel joins them on visits, correcting an overly excited Squirrel with a “Huff” and paw to the back to tell him to calm down. Despite thousands of hours of visits with patients and their families, no two visits have been alike; there’s no such thing as a typical visit. Chad shared two particularly memorable examples with us. The first was a visit to a facility primarily for the families of young patients who are getting treatment away from home. Typically, the visits were with healthy children whose siblings were in care. The staff directed Chad and Gopher to an activity room with a group of children. Typically, Chad uses a subtle but effective hand signal to direct Gopher to the children one-by-one so that each would feel that Gopher had chosen them. This time, however, Gopher made the choice and headed toward a young boy. After they had visited for a bit, Chad gave Gopher the hand signal to go to the next child, but there was no response. Chad tried repeatedly, without success. Gopher would not leave the boy who is petting him. So Chad instead gathered all the children around Gopher so they could all pet him. When it was time to leave, again, Gopher did not respond to the usual signal. Chad was disappointed and embarrassed, but thanked all the kids and they took their leave. On their next visit, Chad learned that the boy, whom Gopher did not want to leave, had passed away the following day. Gopher had sensed what Chad could not. He chose to comfort a boy and make him feel special. From that day Chad’s mantra became, “Trust your dog.” Chad and Gopher have since done thousands of hours in hospice care with patients at the end of their lives. They find it uniquely rewarding. Chad and Carla had seen the benefits of animal therapy in real life before they had a dog. “That is what we wanted to do. If it didn’t work out, we would have found another job for Gopher.” Chad says, “You can be a pet but you have to have a job, no matter how simple. Dogs do better with a purpose.” The Burgess humans also have a purpose: “We like doing as much as we can for those around us.” That is a higher calling. Pictured: Chad and Carla Burgess with Gopher and Squirrel. Squirrel is not only a Therapy Animal but also works Search and Rescue with Carla who is President of Canines Search Midwest.